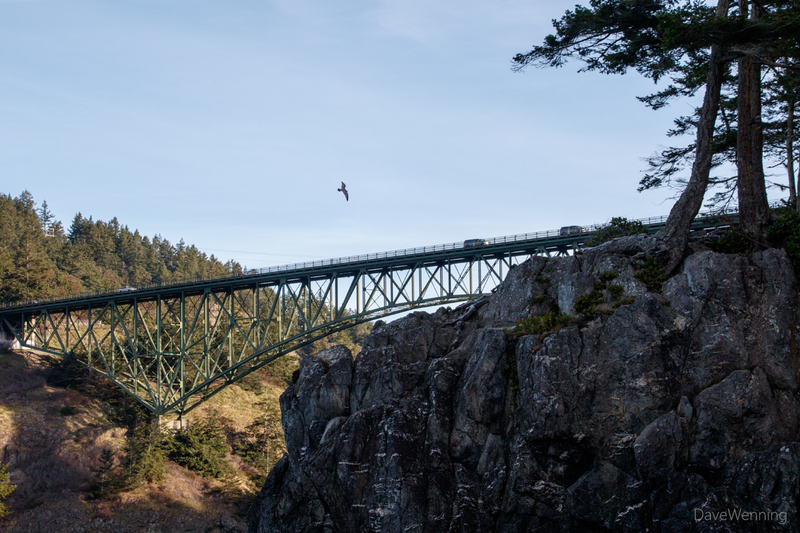 Lucky number seven describes this year's First Day Hike at Deception Pass State Park. I have attended all seven, and once again, we were treated to a perfect rain-free New Year's Day. This is one of the benefits of an Olympic Rain Shadow location. 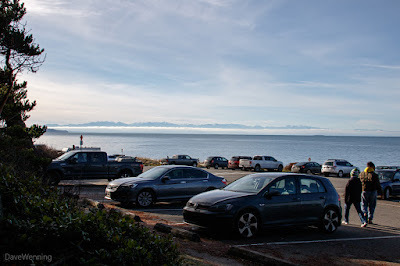 Yesterday, however, all of western Washington had great weather. 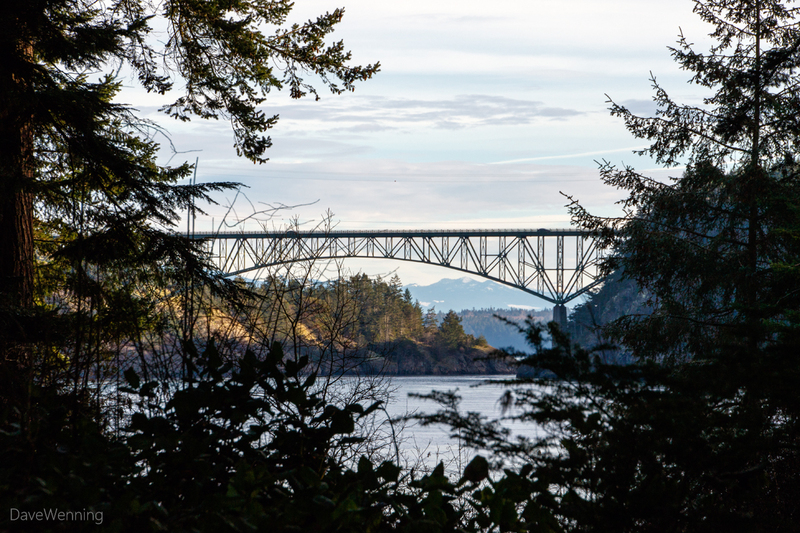 At 10:00 am, we gathered in the meeting room at the West Beach food service building to fuel up with coffee, bagels and pastries provided by the Deception Pass Park Foundation. Although the skies were clear, it was a chilly morning. 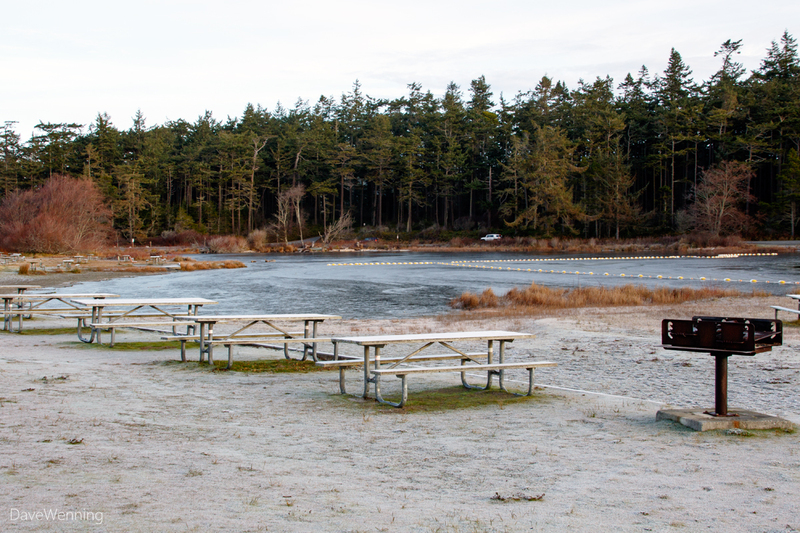 With the temperature at 27° F/-3° C, Cranberry Lake was covered with a skim of ice. 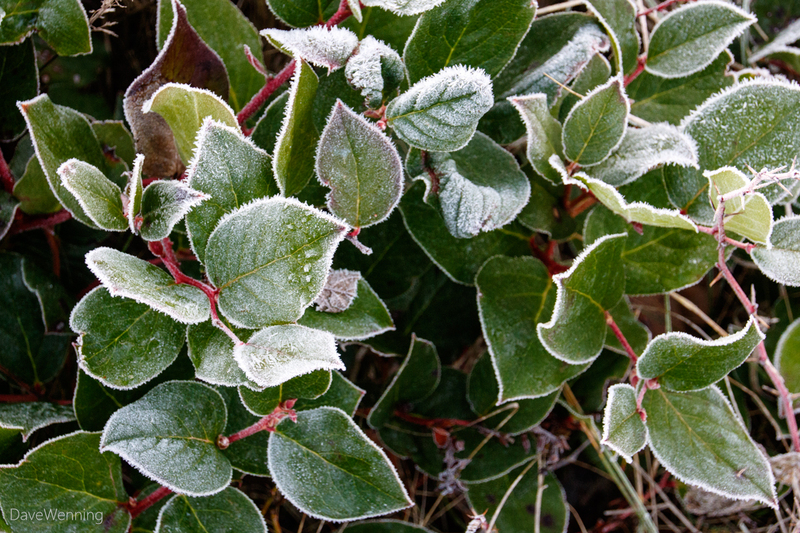 The picnic area and surrounding foliage were decorated with frost. 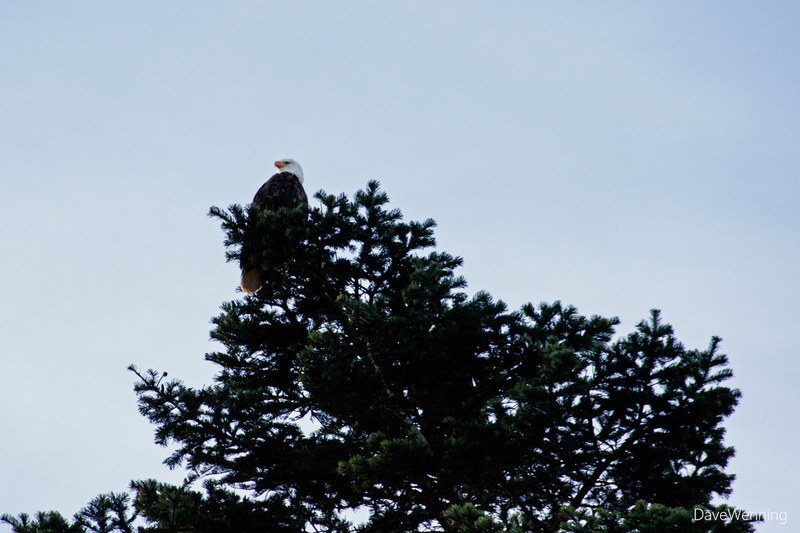 When we started the hike, the West Beach resident pair of Bald Eagles were in their usual spot overseeing the event. Left: Both could be seen in back-lit silhouette. 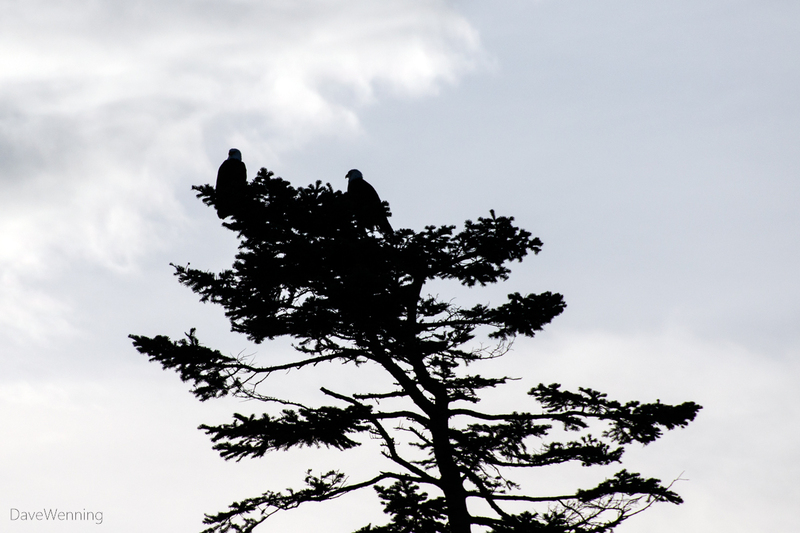 Right: From a different angle, it's easier to tell they are Bald Eagles. Its mate is hidden to the right behind foliage. 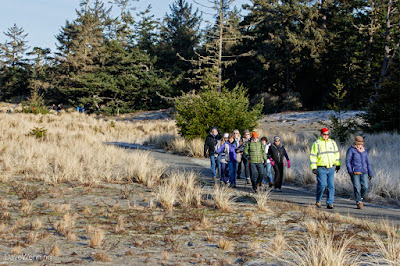 After setting off, we quickly dispersed into small groups to explore the Sand Dunes and Dune Forest. 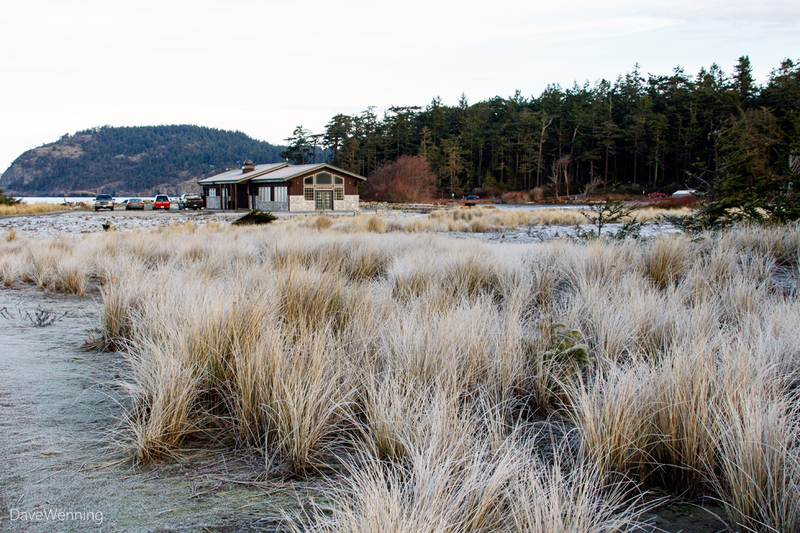 Although many miles inland from the Pacific Ocean, this site on the Strait of Juan de Fuca exhibits ocean-like shoreline conditions. The paved interpretive Sand Dune Loop Trail is ADA compliant. 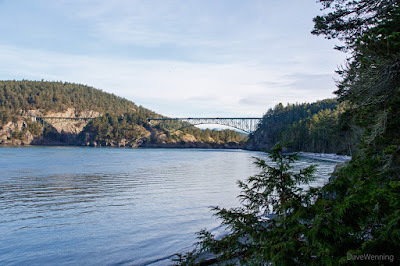 After completing the Sand Dune Loop Trail (it is an easy 1.2 miles/2 km in length), I headed up to the amphitheater on Deception Pass to pick up the North Beach Trail. Left: On the way, the first glimpse of the bridge comes into view through the trees. The North Cascades can be seen in the background. Click or right-click the photos to view them full size. 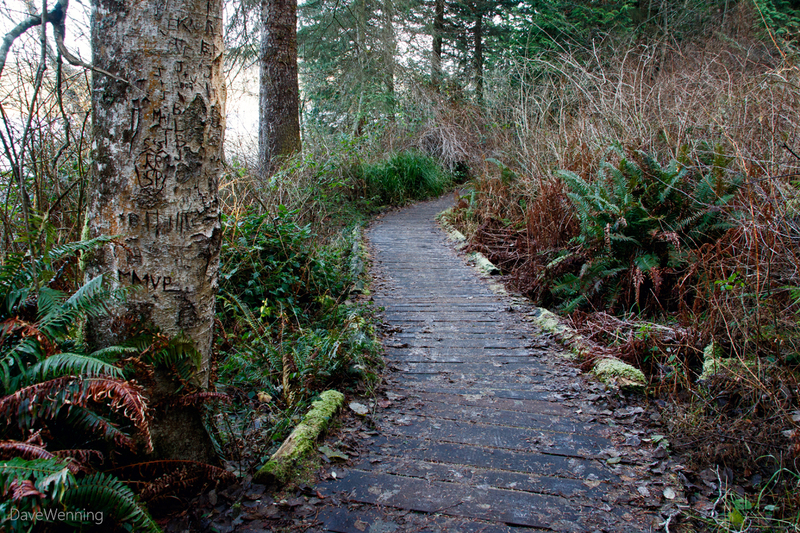 Right: The North Beach Trail begins with a series of boardwalks that cross an area of wetland. About half way along the North Beach Trail, the Deception Pass Bridge comes into full view. I was heading for that frost covered beach area on the right. This big fellow next to the trail is a glacial erratic. It is bigger than it looks in the photo. The protrusion in the front comes up to my shoulders. This light gray stone, probably granite, is different from the local light brown material. This is a hint that it was probably brought here from somewhere else. 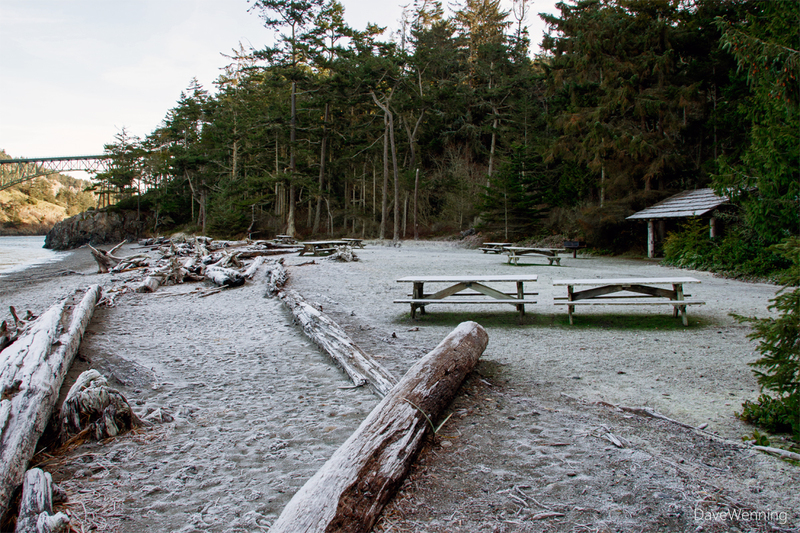 Left: In its almost perpetual winter shade, everything at North Beach was covered with frost. 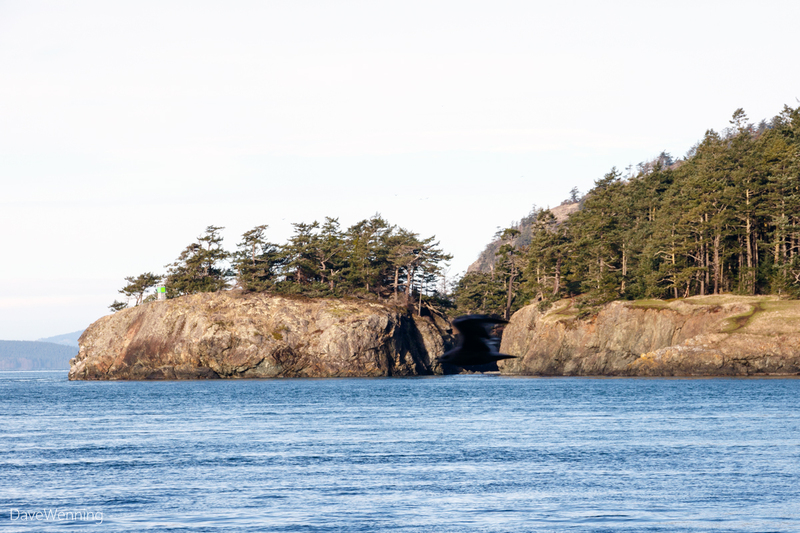 Right: Across Deception Pass, at the same time, Lighthouse Point basked in the low winter sun. North Beach provides another fine bridge view. Even the gulls were out enjoying this beautiful New Year's Day. 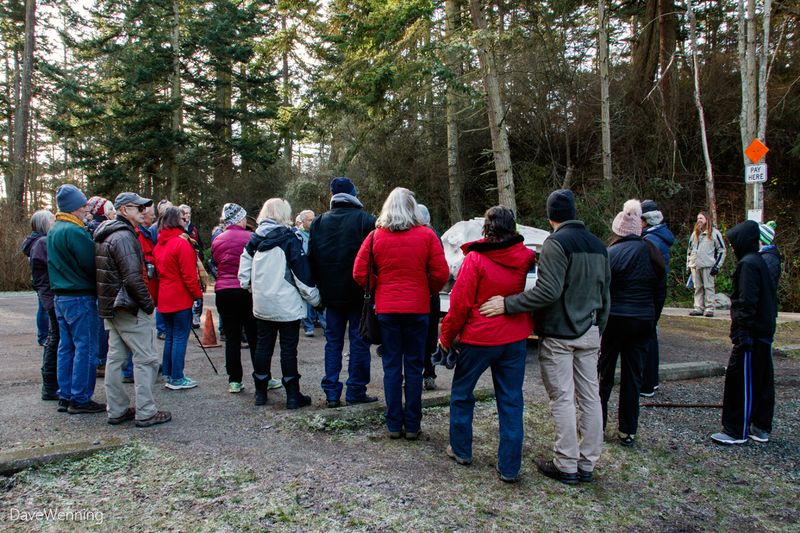 When I got back to the amphitheater, I noticed a crowd had gathered. 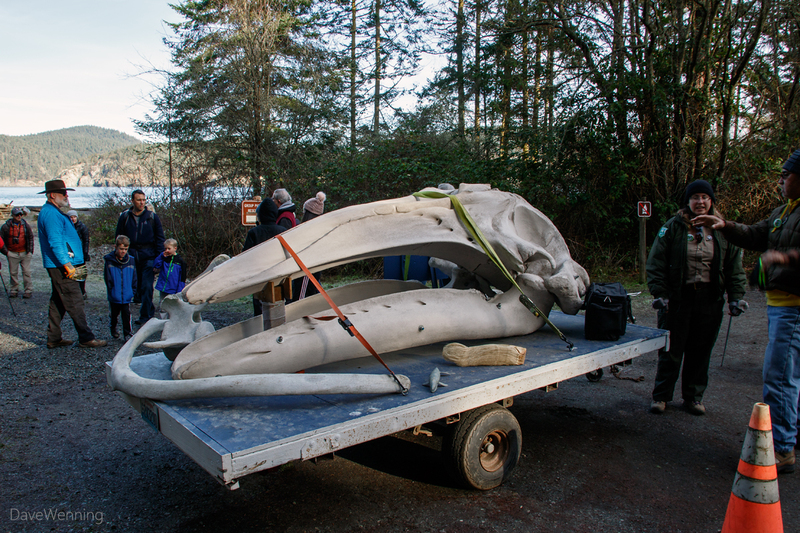 The object of their interest was Gracie the Gray Whale. Gracie likes to make new friends during special events. Jacqueline French, the park's AmeriCorps Interpreter, enjoys educating visitors about this indigenous marine mammal. From West Beach, I have seen Gracie's relatives swimming out in the Strait. Heading back to my car, I noticed the Olympic Mountains rising above a low cloud bank. From where I stood, the mountains were about 50 miles/80 km away. 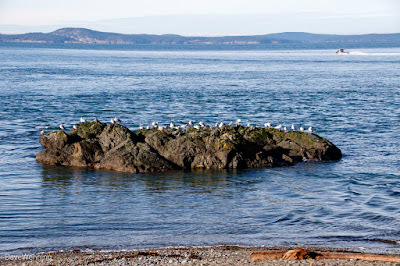 Just offshore from the parking lot, there were only gulls on "Fraggle Rock." I wondered where the Black Oystercatchers and Cormorants were. Too much New Year's Eve, perhaps, was keeping them from venturing out. "Fraggle Rock" is my name for this "little world apart." 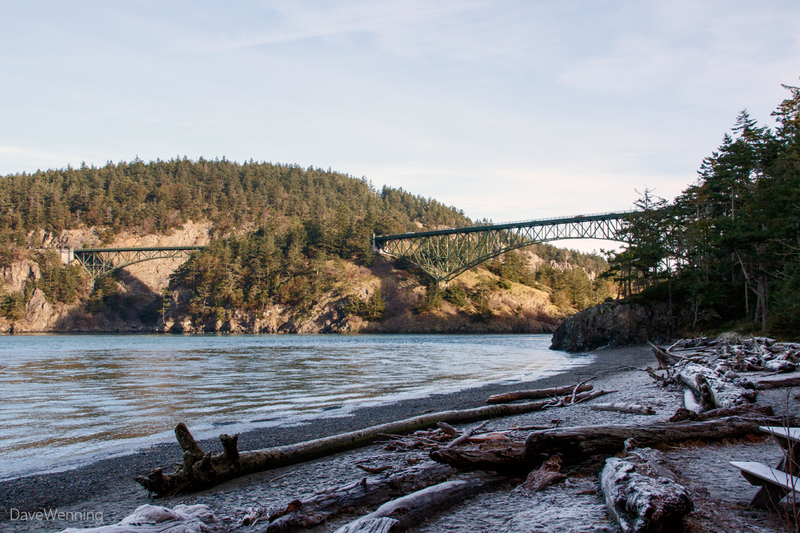 One of the best ways I can think of to spend New Year's morning is hiking at Deception Pass State Park. 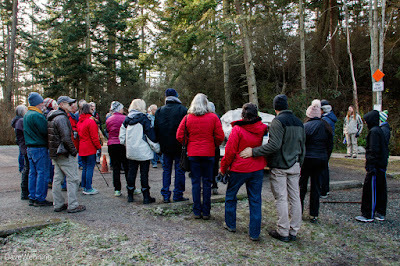 During each of the seven, we have explored a different section of the park. 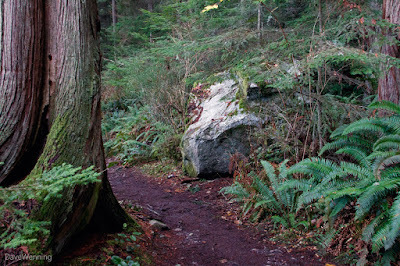 I am already looking forward to my eight First Day Hike in 2019. I wonder where it will take us.